Chatting Over Chocolate: Magical Monday: 10 Tricks & 10 Treats of Mickey's Not-So-Scary Halloween Party! 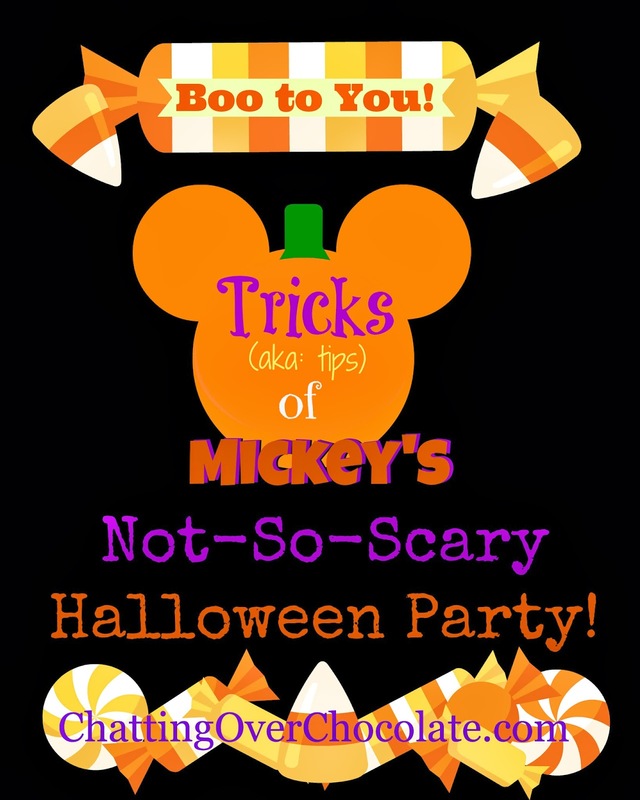 Magical Monday: 10 Tricks & 10 Treats of Mickey's Not-So-Scary Halloween Party! I'm baaaack after enjoying 17 MAGICAL days at Walt Disney World! 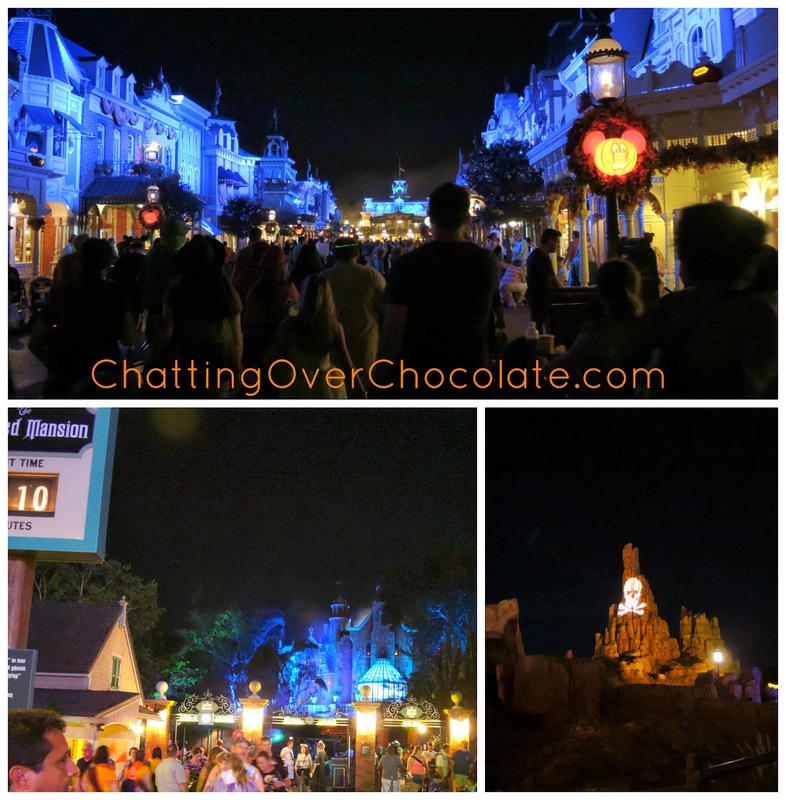 One of the highlights of our fall Disney trip to was attending Mickey's Not-So-Scary Halloween Party! L-O-V-E it! Today I'm delighted to share some of my favorite tricks to help you get the most out of this special event, as well as some of the reasons it's always such a treat to attend! No worries if you won't be hitting the party this year (on select dates between now and November 1st), as this blog post is perfectly pin-able for a future fall when you may! 1. A parade that's actually better than the candy tossed out at the end! Boo to you and you and you and you ... Happy Halloween! Disney's Boo To You! Halloween Parade never disappoints! 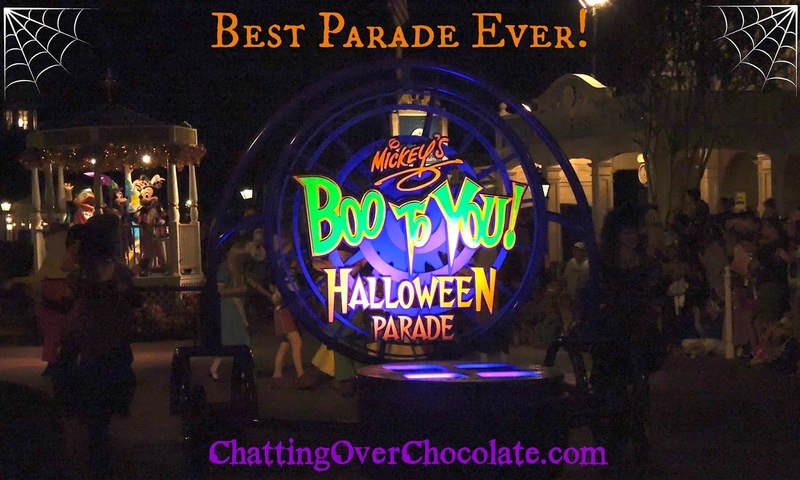 We rarely hit parades these days, but this special Halloween parade is absolutely fantastic! It offers something for everyone, and you won't even mind that you'll have its fun soundtrack stuck in your head from here 'til Halloween! 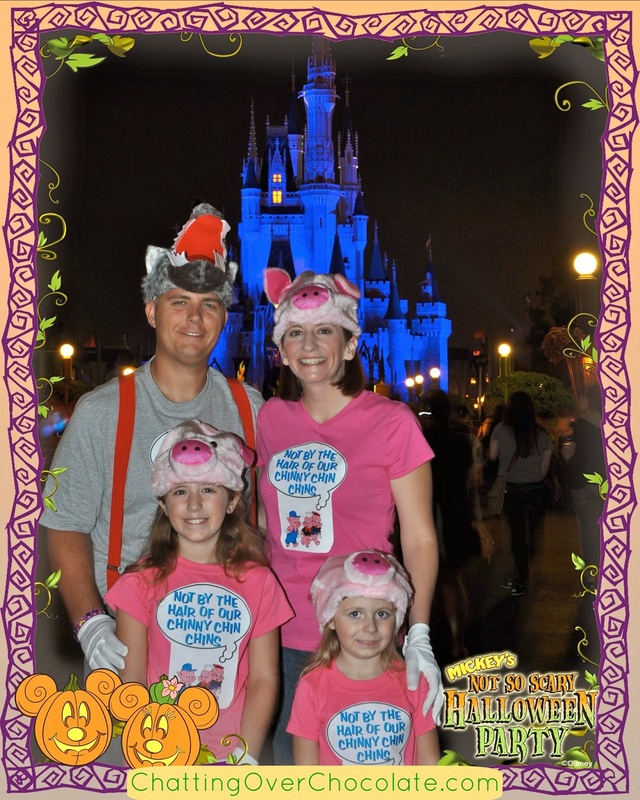 In October 2010 and we went as the 3 Little Pigs and the Big Bad Wolf. I cannot tell you how much FUN it was being there as those characters! During the Boo to You! parade Alice (of the famed Wonderland area) came over to us and warned the girls and I other pigs and I of the Big Bad Wolf beside us. Wendy also pointed us out to Peter Pan while passing by. Best of all, thee Big Bad Wolf himself was in the parade and approached us pigs rubbing his belly, pointing to his mouth and then to his tummy! I laughed so hard! (Maybe you had to be there. ;)) Several people stopped us commenting on loving our theme and costumes, one even requested a picture. It made the evening even more fun! Attending the party this year was a surprise to our girls so we opted not to buy or make full costumes, but we couldn't resist taking part in the fun in some way. I had a simple, inexpensive idea. We decided to just glow go with it! 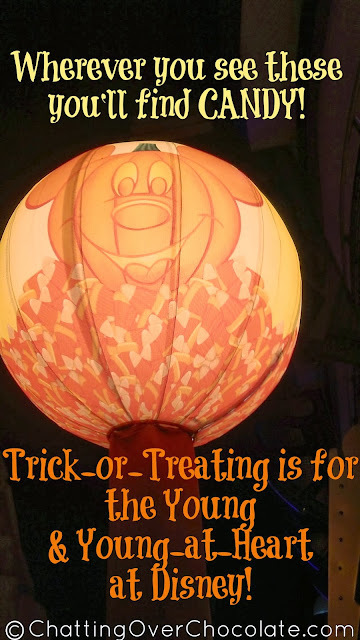 You're never "too old" for trick-or-treating at Disney World! Wherever you see one of these adorable balloons you'll find cast members ready to toss a handful of candy into your treat bag. That's right, a handful! No waiting in line for one itty bitty tootsie roll here! 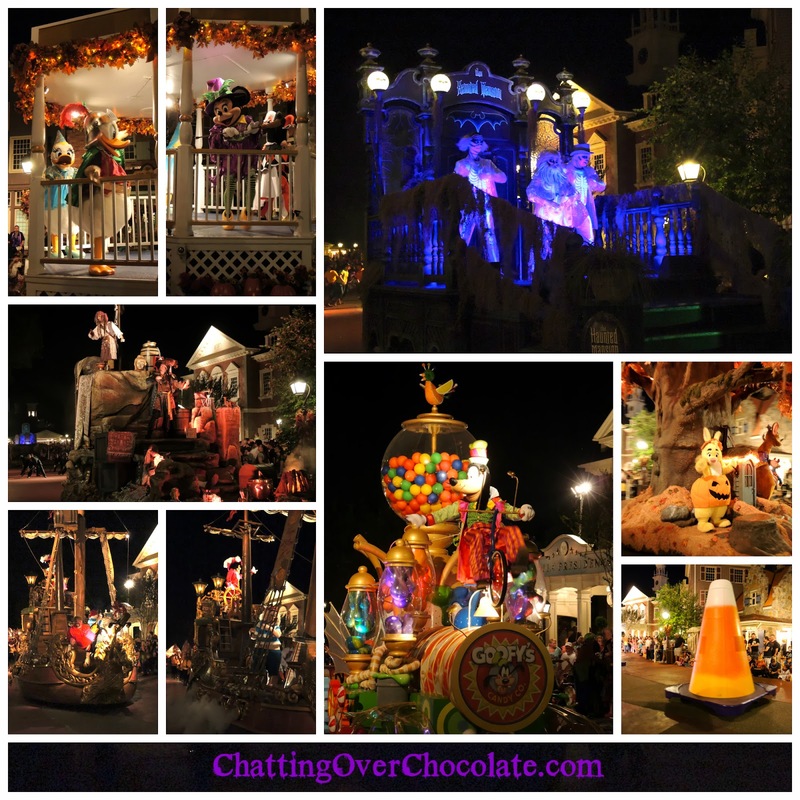 (In our experience) guests receive plenty of chocolate, sour, chewy, and sweet glorious candy goodness ...enough to last the following two weeks of munching at the resort, the flight home, and as a special treat when watching vacation vids (or blogging about MNSSHP) after arriving home! My favorite treat stop this year was actually INSIDE The Tiki Room! No show, but the birds were still moving around ... different and fun! But there was chocolate, woohoo! 4. A can't-miss Halloween fireworks spectacular! No one puts on a fireworks spectacular quite like the pyrotechnics paid in pixie dust, and boy do they light the sky in an extra special way for Halloween! They combine Cinderella Castle, a spooktacular soundtrack, and fireworks used in ways you've never seen, to create a show that's not to be missed! 5. Villains Mix and Mingle. Disney Villains put on a not-so-frightful, but fantastically fun stage show in front of the Castle multiple times throughout the party. Stick around afterward as they step off that stage to meet and greet! After all, you can't fill your entire Disney scrapbook with pics of Princesses, can you? 7. Disney Pixar Dance Parties! Dancing with characters from Monsters University or Toy Story at no lines involved Character Dance Parties is such a blast! The Monstrous Scream-O-Ween Ball at Rockettower Plaza Stage in Tomorrowland is the perfect place for some BOO-ty shaking, or perhaps you'd prefer to kick up your heels cowboy boots at Woody's Happy Harvest Roundup in The Diamond Horseshoe in Liberty Square. 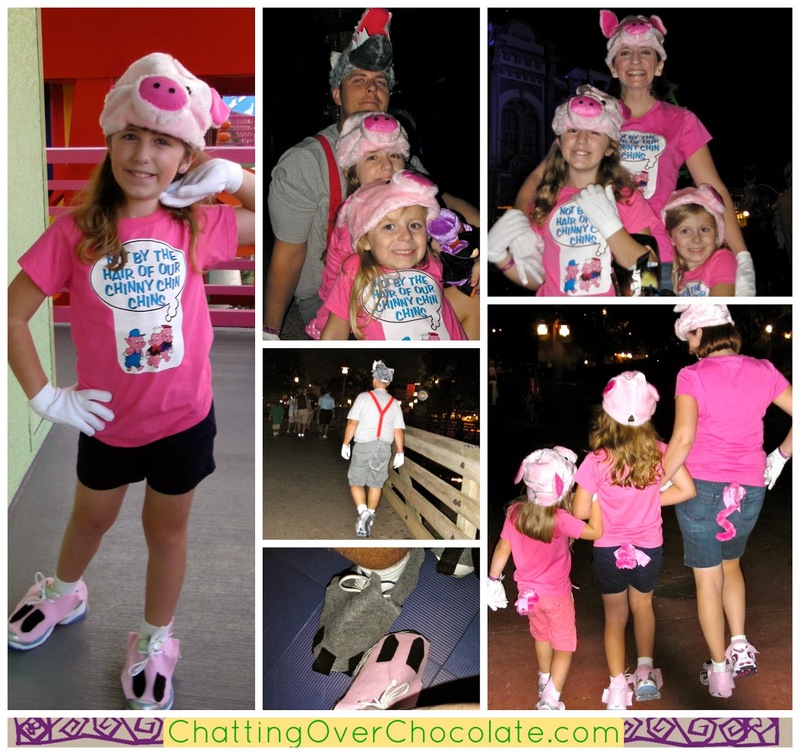 These are fun opportunities to interact with characters in a completely different way! At the Monstrous Scream-O-Ween Ball I was encouraging Little One to go dance with Boo from Monsters Inc.., just then Boo came to us and approached her to dance! Magical moments, they happen constantly at WDW. Gotta love DISNEY! 8. Event-only merch and themed holiday goodies! Disney any night of the week is special, but they pull out all the stops on party nights. The buildings, walkways, mountains, castle, you name it - it will be specially lit for the occasion. These special touches add a really unique atmosphere that you won't experience during normal park hours! 1. The Party starts at 7pm, but your ticket will gain you entry to the Magic Kingdom at 4pm! I highly recommend NOT using a park ticket for that day. Instead, enjoy a more laid back morning taking advantage of all your resort has to offer, or head to Downtown Disney for some shopping and a bite to eat. 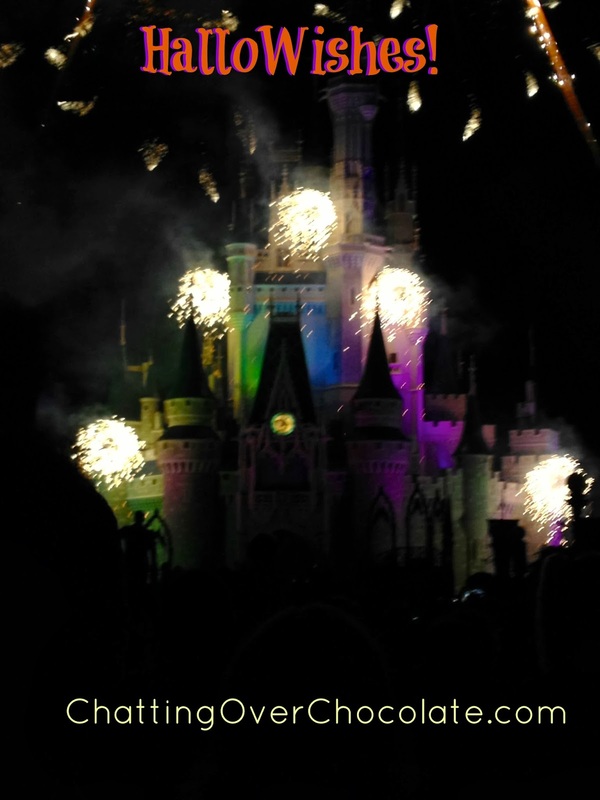 The party goes until midnight so arriving at 4pm allows you 8 full hours at Magic Kingdom, all on your party ticket! 2. It's nearly impossible to do everything that Mickey's Not-So-Scary Halloween Party has to offer so PLAN AHEAD! I cannot stress this enough, go with a game plan! Talk with your family/group beforehand and find out what is most important to everyone, then prioritize accordingly. Arriving with a well thought out plan for the night will really allow you to make the most of it! 3. Dress for Halloween in FLORIDA. In the midwest we normally have to think about costumes being warm enough for very cold weather. (One of my childhood Halloweens was actually postponed due to snow!) 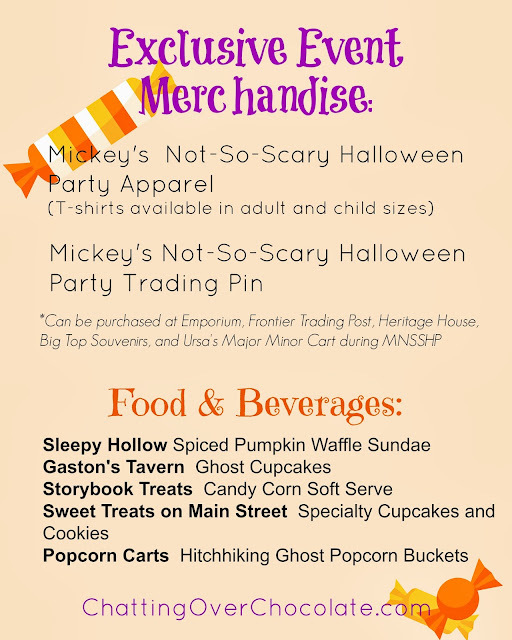 However, when planning costumes for Mickey's Not-So-Scary Halloween Party keep in mind that even October in Florida can be HOT. Choosing a costume that's comfortable, not too bulky to fit into rides, and not so heavy that you'll end up miserable will make a big difference! 4. Fans of Sorcerers of the Magic Kingdom, don't miss your complimentary party exclusive game card! They begin passing these cards out at the firehouse on Main Street after party guests are admitted at 4pm. I recommend picking yours up before the event officially starts at 7:00. This will free up more party time and will also give you a much better chance at snagging a card as they have been known to occasionally run out! 5. Don't forget to visit the Haunted Mansion! Not only is this attraction perfect in theming for the event, you'll also find some things exclusive to the party here! In front of the Mansion you'll notice a PhotoPass photographer. Get your PhotoPass ready because this photographer will offer special "magic shots" (photos that appear to include hitchhiking ghosts). You can also interact with Madame Carlotta who you'll find sitting on a bench near the Mansion talking to guests who pass by. Tip: Check this out earlier in the evening to ensure she'll still be there! I noticed her from a distance while passing the attraction in the early evening. We returned at 11pm assuming she'd be there the entire party, but by that time she had gone. 8. Bring the music home with you! If you find yourself LOVING the Halloween music playing during Mickey's Not-So-Scary Halloween Party (especially in the Boo to You! 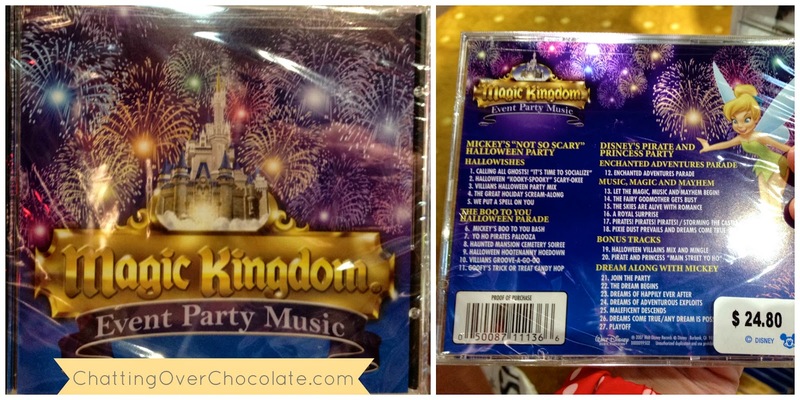 parade), check out the Magic Kingdom Event Party Music CD! This is not event-only merchandise (meaning it's not something that you can purchase during the party exclusively), but it can only be purchased at Walt Disney World. You cannot buy it through their website, and listings for people selling it on eBay and elsewhere reflect the fact that it's hard to come by outside of the Parks. This is a souvenir that you won't regret picking up if you enjoy this special party music. 9. Make it simple to keep those goodies separate! If your family plans to use the trick-or-treat bags Disney offers the party attendees be sure to bring a sharpie to write names on those goodie bags! 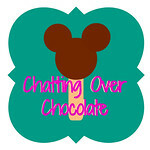 This will save you time and possibly chocolate eating accusations later. No one wants to hear, "he just eat my Snickers bar" later on. 10. Food allergies don't have to keep you from a "sweet" night. If someone in your group requires sugar-free or gluten-free options see Guest Relations at City Hall. Love this post! And your glow stick mickeys came out sooo good! Just curious - I keep hearing about the Headless Horseman - does he make an appearance for the Halloween party only or for the parade? We don't have him out here and that would be so cool to see! I love the Boo to You Parade!!! So glad to see you back, Brenda! Wow! 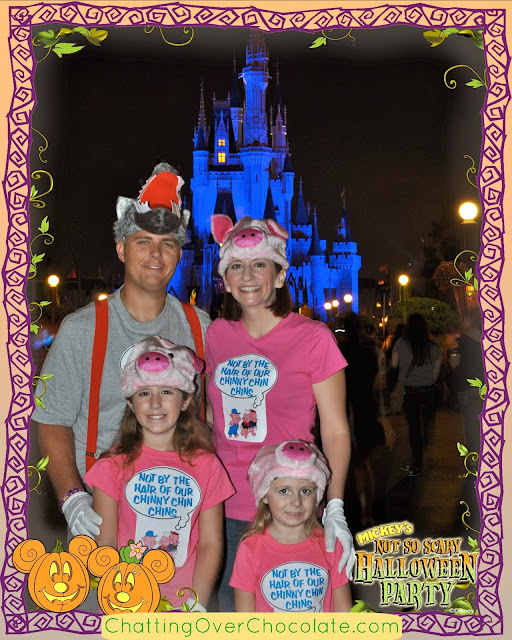 17 days at Disney World? That's awesome! Sounds like a really fun time. 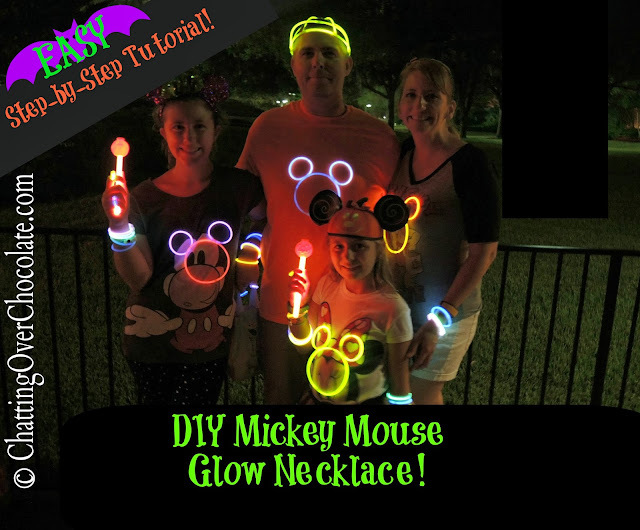 I love the glow in the dark Mickey necklaces. Happy to see you blogging again. Have a wonderful week! Hopped over from Lemon Tree Dwelling! We love this celebration and have done both this and the Very Merry Christmas Party! They are by far our favorite events at Disney and the fireworks shows for those events alone are worth the ticket price IMO! Cant' wait to take our kids back next Thanksgiving! Great ideas! We will be there next year and our two year old LOVES Mickey. We will for sure check this out when we are there. Thank you so much for posting such a great tutorial. Love it! Pinned it to remember this! Hi Brenda, the minute I saw the little Mickey ears I knew it was your post and came to say hi! I'm the worst bloggy friend ever! Haven't visited you in a while but I know you've been having a lot of fun with all things Disney! Wish I was there too! soon I will have free time and will be able to enjoy and visit all my favorite blogs once again. Big hug and follow you over here from Serenity You's party! Too.much.fun. Can't wait to take our girl's to Disney!! Will definitely have to go during this Season in the future because it looks like a blast!! THANKS for sharing on Sunday FUNday! Omgosh love the three lil pigs!! !